I have another great recipe I made, inspired by a post I found on The Gunny Sack’s blog, here She has some really great pictures explaining how to make the rolls so I found it very useful. There are so many variations you can make with this recipe and this following one is my favorite. 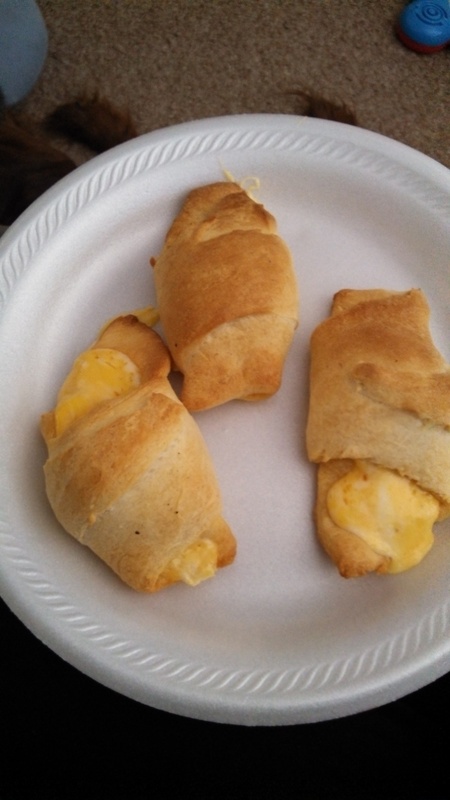 I love crescent rolls so much; they are so light and fluffy, and it complements the other ingredients so well. It’s also very easy to make and that is always a plus! I used to be intimidated by crescent rolls and now I feel so silly for ever thinking that they were hard to make! Seriously, if I can make this with a baby pulling on my pants and talking on the phone, anyone can do this! * Cube cheese into small pieces, you will need 16 pieces and will have plenty left over, so refrigerate remaining cheese for next time or use for something else. * Open crescent rolls, unroll and divide along perforations. Like I said before, there are many ways you can make this recipe your own. I found using a cheese stick cut into pieces can work just as well although it’s a bit more difficult to roll up. You can use biscuits or rolls and you can also sprinkle with Italian seasoning and Parmesan cheese. If you do, moisten the biscuits or rolls first with water or a beaten egg. Enjoy! Please comment if you tried this or did something different.